Take Me to the Prayers! Today, I am writing to invite you to join me to continue praying. Specifically, I’m inviting you into a 31-day journey to pray for the Special General Conference. On January 27, we’ll begin sharing daily prayers. You’ll continue to receive one email on Sunday afternoon with prayers for each day of the week. Simply click below and let us know, “I will pray!” and you’ll start receiving the email on Sunday afternoon. Many of you are praying daily. As the Special Session of General Conference draws closer, we are preparing daily prayers. We will continue to pray from 2:23 – 2:26 each day. If you are already receiving the weekly prayer, you don’t need to do anything. You’ll continue to receive prayers. If you missed the opportunity in the fall, you are invited to join the prayer journey. Click below to be a part of the 31 days of prayer. Let us become more who God has created us to be by praying together for one another and our church. Oswald Chambers in his book, My Utmost for His Highest, wrote, “Prayer does not fit us for the greater works; prayer is the greater work.” Over the past 4 months, we have focused upon the great work of prayer. As I stated in the beginning, it is my hope, my desire, to raise up a new generation of Methodists who will do for our day what John and Charles Wesley did for their day. I am writing to invite you to continue this prayer journey with me. I want to provide you with a weekly prayer and with prayer resources between now and the conclusion of the Special Session of General Conference in February. If you are willing to take this journey with me, click here to receive the prayer for this week. Please enter your first name, email address, and click submit. You will immediately receive the prayer for this week via email. Then, every Sunday afternoon, you will receive a prayer for the week. This invitation is in relationship to Bishop Palmer’s invitation to pray daily for the Special Session of General Conference, February 23-26, 2019. I want to use our Bishop’s invitation as another point of raising up a new generation of Methodists. Below are several suggestions and resources for your use. Pause and pray daily for our church’s mission and way forward. For four minutes every day, from 2:23 through 2:26 PM, stop and pray for the Special Session of General Conference. (Notice that 2:23 to 2:26 coincides with the dates of the Special Session). I will be providing at least one prayer a week to assist you. You will receive a weekly email with prayers and/or prayer resources. Engage in a weekly Wesleyan 24-hour fast from Thursday after dinner to Friday mid-afternoon. Those who have health situations making food fasts undesirable might consider fasting from social media, emails or another daily activity. Consider using the weekly prayer calendar that is posted on the UMCPrays.org website. The calendar will be there through the end of February 2019. We will have the opportunity to pray for a unique group of names each week. The names will balance United States bishops and delegates with Central Conference bishops and delegates. It will also include General Secretaries, Commission on a Way Forward members, the Commission of the General Conference and the staff of the General Conference. If you are ready and willing to take this prayer journey with me, just click this link, to receive the prayer for this week. Sara Thomas and I have provided a considerable amount of prayer and leader development resources for you and your church on www.transformingmission.org. Please let me know if you can’t find what you are looking for. It is through prayer that you and I keep our focus upon God’s plan and purpose for our lives. It is easy to give into doing good things, even if it is for all the right reasons. It is easy to lose our focus upon God’s call upon our lives. It is easy to switch our allegiance from God to working for the “common good.” It is easy to lose our identity even in midst of spiritual activities and social action. It is easy to give into the “this must be right” feeling when the crowd agrees. It is difficult to speak up and act when it is against the crowd. The power to focus upon and live out God’s plan and purpose come through prayer. There is a difference between a prayer life and a life of prayer. It is the life of prayer that keeps us focused upon God’s desire for the church and all of creation. Luke presents Jesus as a person of prayer. Whether it is at his baptism, dealing with popularity, choosing leaders, or feeding 5000 people on the hillside, Jesus is praying. Throughout his gospel, Luke shows us that Jesus maintains his relationship with God through prayer. Now, at the end of his gospel, he has Jesus praying as he blesses his followers. This Holy Spirit power in Jesus is also the Holy Spirit power in the church. It is the power to move beyond the cowardice and hesitation to witness across the barriers that keep people separated from God’s love and one another. So, at the end of his gospel, Luke has Jesus preparing his followers to receive power to be his witnesses. This connection between prayer and the Holy Spirit is unique in Luke. In John, Jesus is divine by nature. He does not need prayer. He comes from God and is going back to God. He is aware of everything. There is no agony, no struggle, no Gethsemane. Matthew has Jesus as the authoritative teacher of the Word of God. Jesus is the final authority in his teaching. Mark presents Jesus like an exorcist, constantly in contact with forces of evil. But Luke has Jesus as a person of prayer. He is filled with the Spirit of God. The Spirit in Jesus is the same Spirit available to the church. The qualities of Jesus are the qualities of church. In the gospels, there are no photos of Jesus, but four portraits of Jesus. It is in Luke’s portrait that we begin to understand why we are in the presence of God. We get an up close view of the Holy Spirit in the birth, life, death, and resurrection of Jesus. We begin to see that Jesus is available to us as the church. And, we begin to understand that Holy Spirit power comes through prayer. The Benediction is the final word, the final blessing. But the blessing is also the assurance of God’s favor and protection. It is also the promise of God’s grace and peace. Just as God instructed Moses to equip Aaron and his family to bless the Israelites, Jesus now blesses his followers. With his blessing our witness begins! This story takes place in the Upper Room on the day we call Maundy Thursday. The word “Maundy” means “mandate” or “commitment”. In Luke, this mandate was to keep the Lord’s Supper. In John, the mandate was to wash feet. The mandate is to remember to re-member. Around the table, as part of his farewell, Jesus had a conversation with his disciples. The conversation covered the life they had together, what was about to happen, and the pressures they were going to face. As the disciples engaged in the discussion, they revealed their self-seeking quest for status, which brought about betrayal and denial. Jesus offered an assurance of comfort, guidance, and strength as he instructed his disciples in ways to address the squabbles and temptations of their time. In this story, we get this strange reference to Satan. “Simon, Simon, look! Satan has asserted the right to sift you all like wheat…” Jesus predicts that they all will fall away. Peter objects. He says he will not fall away. Luke uses this story to place the problem of unfaithful disciples in a larger context. The community falls apart after the shattering experience of the crucifixion. Luke sees this as a test. In the Hebrew, the word “sift” means to test. It is an image which comes from the prophet Amos, “…to sift like wheat.” In Jewish Literature, Satan is one of the angels in the council of heaven. The word “Satan” means “adversary.” It refers to “one who is the devil’s advocate” or “one who raises an objection.” It is also used to refer to “one who calls for a test” or “brings about the opposition.” Luke uses this image as an assault by the ultimate power of evil on the emerging kingdom of God. This image comes from The Book of Job. It is here that we get an example of this understanding of Satan. Job believed in God. He was a good and righteous man in his living. From this story, we see that Job went through terrible experiences. He lost all his possessions, his family, and all he held to be important. His friends questioned his faithfulness to God. But, according to the story, he stayed in there with his trust in God. In the end, even though he had been “sifted like wheat,” tested, and challenged, he remained faithful to God. Jesus says, “Satan has permission to put you to that test. I have been praying for you so that after you turn, after you repent, I want you to be leaders and strengthen the others.” Now, of course, Simon Peter does not think he needs to repent nor does he need prayer. From Luke’s perspective, when Jesus is tempted in chapter 4, he resists three temptations. Luke says, “Satan departed from him until an opportune time.” From that moment in chapter 4, Satan does not appear again until this story. (Luke 22:31). The opportunity comes in two ways. The first, “He entered into Judas.” The second, Satan has asserted the right to sift Simon Peter like wheat. Satan got Judas and he almost got Simon Peter. Now, we know what happened. Simon Peter stumbled. Jesus prays for Peter, but Peter must do the turning. Here is the difference between Judas and Peter. Salvation is not only personal but for the whole Christian community. Jesus’ prayer was answered, Peter did “turn back” and did become the leading figure in regathering the disciples after Easter to continue Jesus’ mission. Simon Peter repented. He came back. Simon Peter became a leader. He strengthened others. St. Peter is connected to just about everything Christian. Not because he did not fail, but because he turned, he repented. Jesus’ prayer was answered. I wonder if Judas had repented could he have expected the same thing? Judas became the judge and jury over his own life. He did not give himself or the community the opportunity to turn back to Jesus. What does prayer have to do with it? As Jesus prayed for those who crucified him, so he prays for his followers. Paul says the Holy Spirit prays for us. John says Jesus prays for us. 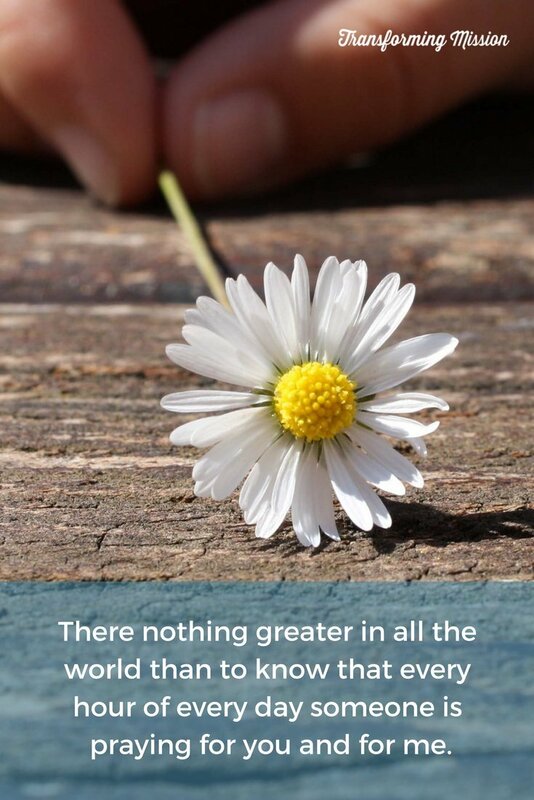 There nothing greater in all the world than to know that every hour of every day someone is praying for you and for me. It is true. No matter what your situation or circumstance. No matter what the test or challenge. The time has come to turn and strengthen others. 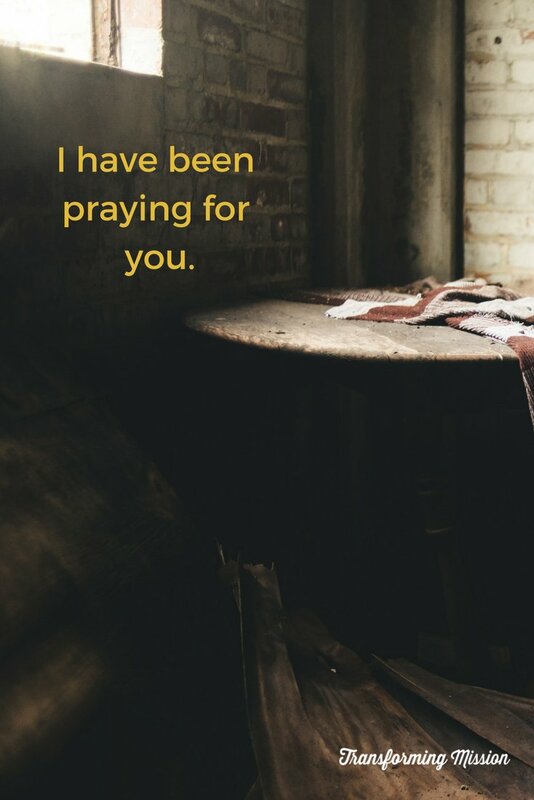 Jesus is praying for you! For Luke, the Scriptures and Holy Communion are at the heart of the church. To read and understand the scriptures is a divine gift in and through the risen Christ. When the Lord’s Supper takes place, there is an invitation to the outsider and hospitality to the stranger. It is in the “breaking of bread” that the stranger is recognized as a friend. When the people are feeling weary and hopeless, Jesus prays. He takes bread, blesses it, breaks it, and gives it. Through these acts of Holy Communion, Jesus is known and a new hope is born. What does prayer have to do with it? The story of the road to Emmaus gives us insight into Luke’s understanding of Jesus and the church. Here is part of that story. For me, this story clearly reveals Luke’s understanding of the meaning of resurrection faith. It is a story of two Jesus followers, walking to Emmaus, having a conversation about Jesus’ death and his missing body. This is Luke’s way of saying that being with the earthly Jesus, hearing his teaching, seeing his miracles and knowing the example of his life are not enough apart from an experience of the risen Christ and the gift of the Holy Spirit. To recognize God’s act in Jesus is not a matter of our human insight but is a divine gift. The two Jesus followers began to give a summary of what had happened. Their summary was not wrong but, because of his death, they did not perceive that Jesus was the promised Messiah. They recited the correct events but did not perceive what had happened. One of them said, “We had hoped he was the one who would redeem Israel.” I think it is important to understand that Jesus’ followers believed that God was present in what Jesus said and what he did. They believed that God’s kingdom of justice was about to dawn. Then came the crucifixion and the shattering of their hopes. Their human wisdom said, “While there’s life, there’s hope.” The death of Jesus was the death of their hope. Even though they had his message, his example, and his ministry, the crucifixion meant that Jesus was another failed idealist. They had no reason to think differently. Their hope was that God would send the Messiah to restore Israel and set Israel free from oppression. These two on the road with Jesus perceived God’s redeeming work in nationalistic terms. For them, it was over. Hope was gone. Jesus then says, “Oh, how foolish you are, and how slow of heart to believe all that the prophets have declared! Was it not necessary that the Messiah should suffer these things and then enter into his glory?” Then beginning with Moses and all the prophets, he interpreted to them the things about himself in all the scriptures. After the resurrection, Jesus’ disciples began to understand the scriptures in light of their Christian faith. They discovered many passages that illustrated their new faith. Luke is clear. He believed that the risen Christ, through the Holy Spirit, was guiding the church into the true meaning of the Scriptures. In his story of the road to Emmaus, Luke introduced the process of reinterpreting the Scripture under the guidance of the risen Christ. While on the road with the two travelers, Jesus is not recognized as the Christ but only as a weary fellow traveler. The two extend an invitation to food and fellowship. As they offer hospitality, Jesus is revealed to them. It is here we get a clue to prayer and hospitality. Jesus did not force himself on them, but when invited, the guest became the host. The meal was an ordinary meal, but the words were the familiar words of Holy Communion. The words, “took bread, blessed and broke it, and gave it…” reflect the language of the liturgy of the Lord’s Table. Jesus took and blessed the bread. Blessing in the Greek is the word “eulogy.” Blessing is to eulogize God. The prayer was, “Blessed are you Lord God creator of the universe. For you sustain all your creation and satisfy our hearts with good things.” God is eulogized as creator, sustainer, and keeper of life. So, the prayer was praising God and not the food. For Luke, God’s saving work in Jesus was a matter of both word and deed. He spoke the word of God and reflected God’s justice and mercy that represented the kingdom of God. Jesus’ followers did the same thing in the church. They not only proclaimed the gospel but they embodied the gospel in their lives. They became the evidence of the Jesus alive on earth. Word and deed were integrated into both Jesus’ life and the life of the early Church. Words without deeds are hypocritical and hollow. Deeds without the word of the gospel miss the point of God’s act in Jesus as the source of normal loving living. 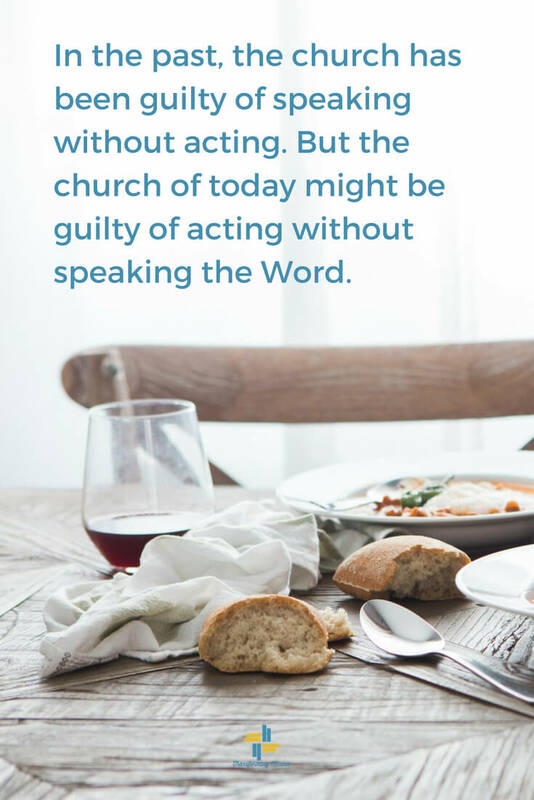 I find it interesting that the church in the past has been guilty of speaking without acting, but the church of today might be guilty of acting without speaking the Word. With that in mind, there are two things important to Luke and to his church. Jesus provides the lens through which we are to look at the scripture. He is the key to our understanding the scripture. Luke wants us to know that knowing about earthly Jesus, hearing his teaching, seeing his miracles, and knowing the example of his life are not enough apart from experiencing the risen Christ and the gift of the Holy Spirit. Three times in Luke’s gospel, we get a story of eating with others: feeding of the 5000, last supper in the Upper Room, and with the travelers on the road to Emmaus. In each story, we have the liturgical formula used in Holy Communion. The Lord’s Supper, Holy Communion, is central to the life of the Church. In the house at Emmaus Jesus is a stranger, yet a guest. Even though he is the guest he becomes the host. It is in the breaking of the bread, the stranger, the outsider, becomes known to them as Jesus himself. For Luke, this is the church. The services of Word and Table are at the heart of the church. To read andunderstand the scriptures is not solely a matter of our human intellect and insight but is a gift in and through Jesus, the risen Christ. When the Lord’s Supper takes place, there is an invitation to the outsider and hospitality to the stranger. It is in the breaking of bread that the risen Christ is made known to the community. 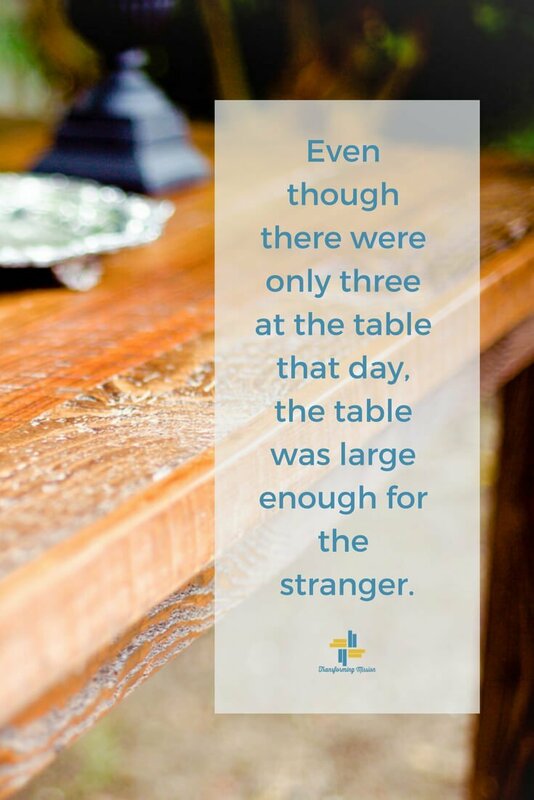 Even though there were only three at the table that day, the table was large enough for the stranger. I think it is important to understand that Jesus put prayer and action together. When you are at the Table with friends and strangers, and when you are giving thanks and praising God, look and listen closely. You are in the presence of Jesus. When ethicist John Kavanaugh went to work for three months at “the house of the dying” in Calcutta, he was seeking a clear answer as to how best to spend the rest of his life. On the first morning there he met Mother Teresa. She asked, “And what can I do for you?” Kavanaugh asked her to pray for him. What I have learned in our study of “What Does Prayer Have To Do With It?” is that Jesus prayed to keep his focus upon God. After ministering to the crowds, he would go into the wilderness, a lonely place, a deserted place, to pray. I have discovered that his life of prayer was not only to keep him focused on God but to keep his trust in God. Jesus did not need clarity as much as he needed trust. In Luke’s gospel, while he is on the cross, Jesus prays a prayer of trust. The death of Jesus occupies six verses in one small paragraph. In the middle of that paragraph, Jesus is praying. “Father, into your hands I commend my spirit,” (Luke 23:46) is a prayer of trust. Nowhere in Luke’s story is there a call for an emotional response. Nowhere do you feel you need to feel bad for Jesus. With Luke’s story in mind, let’s look at the death of Jesus in the context of the gospels and how this first prayer unfolds. The Gospel writers expresse Jesus on the cross in different ways. In Mark’s story, Jesus is on the cross for about six hours. We are told he is crucified at 9:00 in the morning, darkness covers the earth at noon, and he dies at 3:00 in the afternoon. Do we protect them from the sun? Do we cover them when it is cold? Do we give them water? Do we hope they die soon? Many Jewish families knew the pain of crucifixion. But in John’s story, there is nothing that shows a problem or pain. Jesus knows everything that is going to happen. It is as if Jesus is taking care of business. He takes care of his mother. He fulfills the scripture by saying he is thirsty (Psalm 69). There is no thrashing about, no struggle, no pain. Next, there is the crowd. These spectators come to all these kinds of things. Then they go home beating their breasts which is an act of grieving as well as an act of bewilderment and disgust. Finally, there are the followers of Jesus, his friends. The group includes the women who had been with him since Galilee. They stand off at a distance and watch what is going on. We later find out that they are preparing to take care of the body when the Sabbath is over. Over the years, tradition teaches us that there are seven sayings from the cross. We know these sayings as “The Seven Last Words of Jesus.” Three of the saying are found in Luke. You can find three sayings in John. Matthew and Mark share one of the sayings. The prayer shows no distance or pain in relationship to God. It is a prayer of trust. Jesus is praying the psalms, “Into your hands I commit my Spirit” (Psalm 31:5). This is not a resignation. This is who Jesus is. In Luke, he is conceived by the Holy Spirit. After he is baptized, while he is praying, the Holy Spirit descends upon him. The Holy Spirit led him into the wilderness to pray. It was in those moments of prayer that he sought clarity and direction in regard to God’s call upon his life. In his sermon in Nazareth, he quotes the prophet Isaiah, “The Spirit of the Lord is upon me, he has anointed me…” In Luke, Jesus not only possesses the Holy Spirit but promises the Holy Spirit to his followers. So, in The Acts of the Apostles, we witness how the Holy Spirit lives and works in and through the church. In this prayer, “Spirit” simply means “breath,” or “life.” “Father, into your hands I commit my life.” Luke replaces the despairing cry of Psalm 22:1, “My God, my God, why have you abandoned me?” found in Mark with a quiet confidence and trust. Just as Jesus’ prayer of forgiveness becomes a model for his disciples, so his dying prayer of trust in God is used by Stephen at his death (Acts 7:59). The way Jesus died brought glory to God. “Certainly, this man was innocent.” Rome recognizes that Jesus’ death was a great injustice, that in executing Jesus they killed an innocent man. This is a theme Luke carries throughout The Acts of the Apostles. I find it interesting that Luke does not rush to the joy of Easter morning. For Luke, Easter can only be grasped by those who have stood at the cross and reflected upon their own involvement in the sins of humanity that have led to the rejection of God’s revelation in Jesus. Just as the tax collector, who lamented and beat his breast in repentance, did not presume that he would go home justified, neither did the mourners at the crucifixion anticipate the resurrection. As we have seen before, for Luke, grace can only be amazing grace. So, what does prayer have to do with it? In quiet trust and confidence, Jesus commits his life into the hands of God. From his baptism to his decision to go to the cross, Jesus prays. From his teaching about his death to the misunderstanding of who he was as the Christ, the Messiah, Jesus prays. From teaching his followers to pray to forgiving those who intentionally turned their backs on God’s love, Jesus prays. O God, we pray for such trust and confidence as we continue to commit our lives to you. Luke has Jesus praying at particularly important points in his ministry. His pattern has been to go to a desert place or a lonely place to pray. Jesus did this to keep his focus upon what God has called and commissioned him to do. He prays seeking direction when he is tempted to follow the crowd, “Do I go with the crowd or do I go to the cross?” He prays when Simon Peter and the other disciples misunderstood his suffering and dying as a contradiction of who and what they understood the Messiah to be and do. And, he prays when his identity and purpose as suffering Messiah did not match the images of the people who loved him and who followed him. Now, in Luke 24, while he is on the cross, Jesus prays. What does prayer have to do with it? To answer that question, we need some background on the cross. 1. On most of our altars and hanging in our sanctuaries is a cross, the Latin Cross. The truth is we really do not know the shape of the cross. Every tradition has its own cross. The Greek cross looks like a plus sign, two bars the same length. St. Anthony’s Cross looks like a T, a cross piece is on top a vertical stake. The Cross of Andrew is an X, the first letter of Christ in the Greek alphabet. Justin Martyr’s cross is an X shaped cross for Crucifixion. The cross could have been on an impaling stick or a stake in the ground. We don’t know how Jesus was crucified. But because we do not know does not mean we should abandon it. 2. What is it in scripture? In verse 33, they have come to the place of the skull. In the Greek, the word is “cranium”. In the Aramaic, the word is “Golgotha”. In the Latin, the word is “Calavera”. Each is a different name for the same thing. In Luke, it is the place of the skull. 3. For the Romans, Caesar was Lord. The government was central. To speak or act against Rome was considered heresy. Crucifixion was used to warn citizens what would happen to them if they were disloyal to Rome. People were sacrificed on crosses to warn others what would happen to them when they committed heresy. What we know is the crucifixion was a public execution. There is evidence that as many as 800 crosses would line the road like power poles. Persons, mostly men who attempted to overthrow Rome, were impaled on stakes or nailed to crosses. It created fear in the people who passed by. It was a scene like this that Jesus was crucified publicly between two criminals. So, in Luke 24:34, Jesus prays, “Father, forgive them for they do not know what they are doing.” This prayer was in keeping with the character and life of Jesus. He was praying for forgiveness for those who were violating him because they did not know what they are doing. In Luke, the primary problem is ignorance. “Father, forgive them, they do not know what they are doing.” They have killed the Lord of glory in ignorance. It sounds like Jesus forgave them for their ignorance. Could that work for us? Can we be forgiven for our ignorance? These words were spoken by a person whose only weapon was the love of God. Whose only crime was being different. Who raised suspicion because he challenged the systems of hatred, prejudice, and bigotry. Yet, in the midst of being put to death for extending love, even to his enemies, he called upon God to forgive the ignorance of his abusers and accusers. O Jesus, forgive us, our only hope is you. Whatever motivated them to ask was not as important as to pray. As I reflect upon “how to” pray, I think of the tradition in which I grow up. The persons who prayed felt their prayers were more genuine and spirit led when they prayed extemporaneously. They just let it flow because what just flowed was more genuine. They didn’t think about what to pray. What I remember is, what flowed naturally was what was on the surface of their minds. Too often they were not thinking of the conditions of the world or upon the people in need or distress. Those concerns did not automatically flow. What would happen if you listened to the news or read news stories to pray? What would happen if you walked your neighborhood focusing upon your neighbors as you prayed? Would you naturally think of the children, the gun violence, the prejudice, the hunger, or the homeless in your neighborhood? Would you naturally think about the politicians, the first responders, the teachers, the medical personnel? Without preparation, to share your feelings from the surface is to say the same thing all the time. If we do not focus our prayers, our prayers become nothing more than “just how I feel” prayers. I think that is important, but not that important. Is this what the disciples were asking Jesus to teach them to do? Teach us “how to” pray? In Chapter 11, Luke has gathered Jesus’ teaching material on prayer. The same material is scattered about in Matthew, but Luke gathers the material in one place. Immediately following what we know is as the Lord’s Prayer, Luke tells a story on persistence or perseverance in prayer. This teaching is to reassure believers that their prayers are heard and answered. If a grouchy neighbor awakened from sleep will respond to an urgent request for bread, how much more will God respond to our prayers. The story is not about praying harder or longer. Luke is encouraging his community to persist in prayer because to pray is to stay focused upon God and God’s call and commission to ministry. As we have discussed, Jesus’ pattern was to go to a lonely place to pray and then come back to engage in ministry. His time away to pray was to keep his focus upon God’s call and to test his desires in response to God’s call. Luke’s encouragement to persevere in prayer is to keep our focus upon God. Remember in Chapter 10, Luke tells of Jesus sending the disciples out, his instructions on what to take with them, and how to respond to those who accept them and reject them. The “ask,” “seek,” and “knock” material was adopted by the early Christian missionaries as encouragement to live out their mission, depending only on friendly supporters along the way. Luke uses the sayings in relation to prayer. Since God is eager to hear and respond to the believer’s prayer, we may confidently ask, seek, and knock, no longer on human doors, but on the gates of heaven. Luke concludes the teaching material with, “how much more will the heavenly Father give the Holy Spirit to those who ask him.” Remember, in Luke’s gospel, there is a relationship between prayer and the Holy Spirit. We see the connection in Jesus’ ministry. In the Acts of the Apostles, we see the connection where the Holy Spirit comes on the church in response to prayer. Luke is letting his community know that the Holy Spirit in Jesus, and in the church, is just as accessible for them through prayer. Do you think that the Holy Spirit could work in and through your prayers? The power in prayer is to stay focused upon God and God’s call to ministry. Successful prayer involves special preparation. There are times when your mood may not be right; an irritated or anxious temper may get in the way. Or perhaps the preoccupation with work and family may be clouding and crowding your thoughts. To pray is to focus on God and God’s call. To pray is to live in God’s presence and to receive God’s power. So, what does prayer have to do with it? Teach Us to Pray – Why Now? Up to this point, in Luke’s gospel, only Jesus has been praying. Even though the disciples have been present, they have not prayed. The question is, “Why now?” What brings Jesus’s disciples to the point of asking? And since prayer was his practice, why has Jesus waited to this point to give instruction? Before answering the “why now?” question, let’s review. Through prayer, Jesus received his call and commission for ministry. Through prayer, Jesus sought direction and tested his ministry, “Do I go with the crowd or do I go to the cross?” It was through prayer he chose twelve apostles out of all the disciples who followed him. He was seeking those who, in the present, could hold together Israel and the emerging Christian community. Luke, in his story of the feeding of the 5000, has Jesus feeding those who are hungry as the sacrament of Holy Communion. In relationship to Simon Peter’s confession, Jesus prayed because Simon Peter and the other disciples misunderstood his suffering and dying as a contradiction of who and what they understood the Messiah to be and do. In the story of the Transfiguration, Jesus prayed because his identity and purpose as suffering Messiah did not match the images of the people who loved him and who followed him. In the mission of the 70, it is in prayer that Jesus gives thanks to God for the faith given to his followers. Luke has Jesus praying at particularly important points in his ministry. His pattern was to go off to a desert place or a lonely place to pray. It was in those times of prayer that Jesus kept his focus upon the ministry God called and commissioned him to do. Here in Chapter 11, Jesus is off by himself praying. When he returns, his disciples ask him to teach them to pray as John taught his disciples. We know that rabbis taught their students to pray. Many had a style or content. It was their trademark. But, why now? Is it because they have seen John’s disciples and they don’t want to be left out? Have they observed Jesus and come to the place that if Jesus needs to pray maybe we need to pray as well? They had just experienced amazing success. As they returned from their mission, they came to Jesus saying, “Lord, in your name even the demons submit to us!” Are they facing the same temptation Jesus faced of trusting in his own goodness? Sometimes we look at this experience as an embarrassing failure. But maybe, instead of being a failure of their prayer lives, it was the experience that leads them to recognize that to have the power of Jesus to heal and restore, they needed to learn to pray like Jesus. But, why now? Could it be that the ugly head of competition had them arguing among themselves? According to Luke, they broke out into a quarrel over “who was number one.” When they got home, Jesus asked, “What were you quarreling about? They said, “We were arguing over “who was the greatest.” At that point, Jesus took a child and taught them what greatness was like. Maybe through their experiences, both positive and negative, they have become more willing to be taught to pray. Could it be that they are having difficulty with the weight of Jesus’ announcement of his death? All their hopes have been poured into Jesus and he says he is going to be put to death like a criminal. Maybe that is it. The weight of what it means to be a follower of the Christ, the Messiah, is becoming a reality. It is amazing that the disciples did not ask Jesus to teach them how to tell a parable, multiply the loaves, or heal the sick; but they asked him to teach them to pray. And when asked, Jesus taught them a pattern of prayer. The disciples’ request and the response of Jesus is more than a reminder of the importance of prayer for them and for us. It is also important to remember that in Luke’s gospel, the Holy Spirit brings power. For Luke, there is a connection between prayer and power. We have seen on more than one occasion, Jesus receiving clarity, direction, affirmation, and power through prayer. For me, regardless of what motivates you or me to pray is not as important as to pray. Whatever it was that brought the disciples to the point of asking Jesus to teach them to pray, Jesus was ready to provide them with a pattern of prayer. As Jesus’ followers, prayer is our identity. We are who we are as ministers of the gospel through prayer. Whether lay or clergy, prayer brings clarity, direction, affirmation, and power. https://www.transformingmission.org/wp-content/uploads/2018/08/teach-us-to-pray-why-now-blog-1.jpg 1080 1920 Tim Bias https://www.transformingmission.org/wp-content/uploads/2017/09/logo-horizontal-color600x75.png Tim Bias2018-08-28 08:44:442018-08-31 10:51:04Teach Us to Pray - Why Now? Prayer and thanksgiving create space for us to offer ourselves in gratitude to God. We give thanks for those who have come to faith by the power of the Holy Spirit. In Luke 9, we see a critical turning point in the life of Jesus. Up to this point, Jesus has been seeking clarity and direction in regard to his ministry. Now, in Chapter 10, we see Jesus sending his followers out to fulfill the ministry he has been called to do. Before we look at the prayer in verse 21, let’s look at the context of the prayer. Luke has Jesus giving instructions to 70 of his followers. These instructions reflect the mission of the church where the early Christians must come to terms with requirements of sharing the good news with outsiders, outcasts, non-Jews, all known as Gentiles. Luke tells of the disciples being sent out, their return, and their report to Jesus. It is interesting to note that Luke does not give an account of Jesus visiting the towns and villages. Could it be that the emphasis here is upon the “being sent” and not upon the results? First, Jesus tells them why they are being sent. “The harvest is bigger than you can imagine, but there are few workers. Therefore, plead with the Lord of the harvest to send out workers for his harvest” (Luke 10:2). The seed has been and is being sown; the followers of Jesus reap the harvest, the results. It is important to understand that the whole body of Jesus, all of Jesus’ followers, is charged with the mission, not just full-time Christian workers. Many followers, not just the Twelve, are actively engaged in preaching, healing, and helping. All are involved in prayer and material support for the church’s mission. Second, Jesus gives them instructions on what to take with them and the urgency of their mission. With the words, “Go! Be warned…I’m sending you out as lambs among wolves. Carry no wallet, no bag, and no sandals,” Luke pictures those in mission as absolutely dependent, defenseless, and vulnerable. With the words, “Don’t greet anyone along the way,” Luke is symbolically speaking of the urgency of the mission. To not speak to strangers or fellow travelers would be outrageous. The implication is don’t waste time in idle conversation. You have work to do. Third, Jesus gives them instructions on how to respond to those who accept them and reject them. “Whenever you enter a house, first say, ‘May peace be on this house.’ If anyone there shares God’s peace, then your peace will rest on that person…Whenever you enter a city and its people welcome you, eat what they set before you” (Luke 10:5-8). These instructions were literally contextual. During the time of Jesus, there would have been a period of military buildup and political unrest. “May peace be on this house” would refer to the followers of Jesus who rejected the military revolt against Rome, who loved and prayed for their enemies, and refused to participate in the war. During the time of Luke’s writing, those words would have lost their political connotation and referred to those followers of Jesus who shared the peace of God by participating in the Christian community. But even at that, the words were still connected to the life and ministry of Jesus. It is at this moment, at the return of the 70, that Jesus prays. What does prayer have to do with it? It is interesting that this story is found in both Luke and Matthew (Matthew 11). I think it is interesting because in Matthew the story follows Jesus being rejected. In Luke, the story follows Jesus being accepted. It is the same story, but in one gospel it comes after failure and in another gospel, it comes after success. The seventy disciples have returned from a successful mission. Although Jesus begins to rejoice in the Holy Spirit, he warns them, “Don’t rejoice that you have been successful. Rejoice that your names are written in heaven.” In other words, the point is not your success but your faithfulness. Not only in the gospel but in the Acts of the Apostles, prayer and Holy Spirit go hand in hand. Luke talks about the Holy Spirit more than all the other gospel writers combined. It is Luke who has Jesus rejoicing in the Holy Spirit. Remember Luke’s gospel begins with the Holy Spirit creating inspired speech. Before Jesus is born, Mary his mother, Elizabeth and Zachariah, Anna and Simeon are each inspired by the Holy Spirit. There are Spirit inspired songs being sung, bursts of praise, prayers, insights, revelations, and blessings. In this scripture, thanksgiving is an expression of the Holy Spirit. Jesus gives thanks, not for the many acts his followers have performed but, for the many persons who have come to faith in God. Paul, in I Corinthians 12, wrote, “No one can say that Jesus is Lord except by the Holy Spirit.” For Paul, being wise and having intelligence is not equal to having faith or being a Jesus follower. In Luke, the words, “I praise you, Father, Lord of heaven and earth” is an expression of the Holy Spirit in the ministry of Jesus and in the mission of the 70. The words, “you’ve hidden these things from the wise and intelligent and shown them to babies,” is a common expression for those whose faith depends upon God. Saying that these things are hidden from the wise and intelligent does not discourage education or serious reflection. But it does offer rejection of our claims that we can attain knowledge of God and God’s ways by our own achievement. For Luke, we know God because God has graciously revealed Godself to us, first through Israel, then through Christ, and then to and through the church. Our faith is not based upon our own calculations. Our best efforts and best thinking is simply responding to God’s invitation to love. Afterall, it is planted there by God in the first place. We do not arrive at faith because we have worked out our proofs. The proofs might support where we arrive, but proofs are not the way of faith. It is in prayer that Jesus gives thanks to God for the faith given to his followers. You and I give God thanks for our faith in and through prayer. It is through prayer we thank God for the opportunity to put our faith into action by loving and serving in the name of Jesus. As with Jesus, we will be tempted to think we can love and serve on our own. But through prayer, we will keep our focus. Through prayer, we will offer God the praise and give thanks for what God is doing in us and through us. In this prayer, Jesus is giving thanks for those who have come to faith by the power of the Holy Spirit. Who are what are you giving thanks for today? Perhaps you’ll give God thanks in prayer today.